Julia Turshen’s fruit, nut and grain-filled salad will fit right in with the mains on your menu. Whether you’ve hosted Passover Seder for as long as you can remember, or have only attended as a guest until now, you’ve probably collected at least a few crowd-pleasing recipes that absolutely must make the menu each year. And while we’d never want to take anything away from those perennial faves, we think this simple grain salad from Julia Turshen’s cookbook Now & Again is just the dish to infuse some new life into the annual meal. Inspired by the Seder plate fixture, Turshen’s recipe wraps all the ingredients of charoset into a hearty mixture that can be prepared days ahead of your dinner. It’s also the type of side that can easily be doubled (or tripled!) depending on the size of your gathering — a real win for any event where the guest list is in flux. 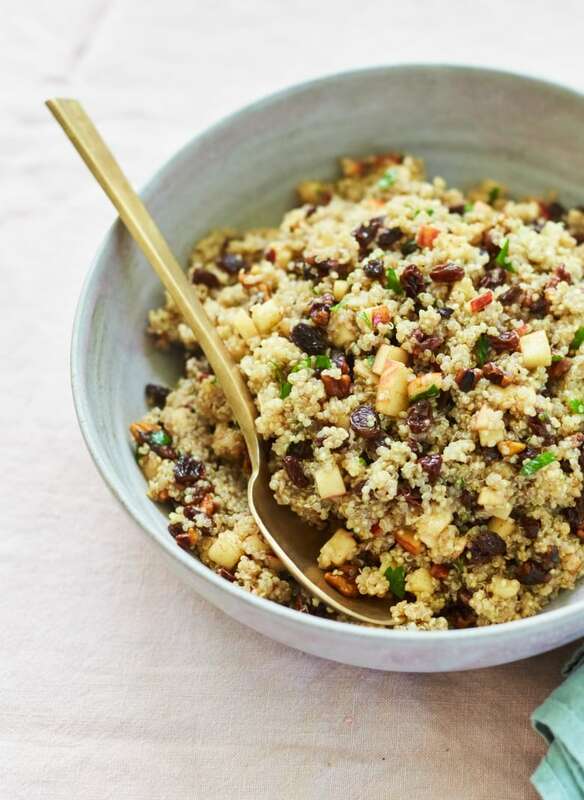 This quinoa side dish has all the flavors of charoset, the mixture of apples, wine, and nuts that is a traditional part of the Seder plate. It’s especially perfect for Passover since it doesn’t include anything leavened. I also love it because you can serve it at room temperature, which means you can absolutely make it in advance. Rinse the quinoa thoroughly in a fine-mesh sieve (this may sound like an annoying step, but don’t skip it; quinoa has a natural coating that tastes soapy). Put the rinsed quinoa into a medium saucepan with 3½ cups water and 2 tsp salt. Bring to a boil, then lower the heat, cover, and simmer until the quinoa has absorbed all of the water, softened, and each grain has “spiraled,” about 12 minutes.